The year 2005 was a very bigfooty year in New Mexico. Several expeditions were held at various locations by the BFRO and others, some of which yielded sightings and footprint photographs. One of the more interesting pieces of data to come out of New Mexico that year was a handprint left on a mobile home's weathered screen window on the Mescalero Indian Reservation. It was found by Dennis Pfohl, a bigfoot investigator (and friend of the 'squatch) from Colorado, who was on the scene investigating activity from the night before. 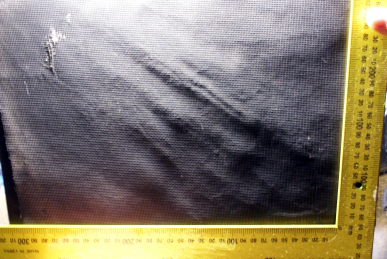 The handprint's size, height from the ground, and context all suggest that it is likely from a sasquatch. Dennis collected the screen, and it is now in his possession. The handprint is still clearly visible and is housed in a picture frame. I had the opportunity to closely examine the screen in person at the Bellingham Conference of 2005. The handprint has the appearance that it could have been made by a giant, dark mitten. The only digit that is clearly discernable is the thumb, which juts out of the palm area at a 54 degree angle. There is a muddy smear inside the "mitten" that is thought to have been made by the initial contact of the hand before the screen was distorted (see below). Thinking this was an interesting and fairly rare piece of possible data, I approached Dennis to ask him about including the hand print in my ever-growing online cast database. Dennis not only agreed, he went the extra mile to write up a summary of his investigation to include with the photos. Thank you to my good friend, Dennis Pfohl, for helping out and being a model of cooperation for others to emulate! I had been to Mescalero, NM several times in two months following up on investigations of reported sasquatch sightings in the area. On the morning of January 29, 2005, I got a call from one of the local investigators who lived in Mescalero informing me that a resident on the northwest corner of town had another disturbance early that morning. We had already met with this young couple before, and they lived in a single-wide mobile home on private property that bordered the scrub oak and pine forest at the base of the mountain. Several times in the previous weeks they had complained about strange noises, rock throwing, and seeing unusual shadows outside after dark. The wife even reported having a quick, fightening glimpse one night of what she thought was a large hair covered head and face looking in through the corner of a bedroom window. The family was understandably uneasy and upset about this prowler, or "visitor," and was happy to have people who would take them seriously and investigate. One evening while on location a neighbor came out to meet us and told us that they had seen a very tall, dark-colored, large man-like creature run between the mobile home and their house. They described its head as reaching the rain gutters of the garage, which was over eight feet from ground level. On the morning of the window disturbance the husband had informed me that he works an early shift and was usually up by 2 am to get ready for his job. He stated that on that morning while in the bathroom shaving for work, he heard a noise outside the bathroom window. The glass in that window was the typical frosted glass, commonly used as privacy glass, so he was unable to see out easily, but did say he saw movement through it. When we investigated later that day, I asked the husband to show me the window. The first thing I noted was its height from ground level. Then we found that the screen had been damaged. Upon closer examination, I discovered what looked to be an impression on the material itself. The husband assured us the screen was in good condition and intact before that night. placing it around the eight-foot level. As we did a thorough search around the property, including directly below the window itself for any impressions, we found nothing of obvious interest. Unfortunately the ground was dry, and mostly consisted of crushed granite that made it resistant to footprints. First, to qualify my report I have to let the reader know that I have lot of experience handling screening material as part of my small business which includes building and installing new, as well as re-screening, residential and commercial screens. Often that includes replacing torn, damaged, and weather-checked, brittle screening material with new. Commonly found in residences are aluminum and fiberglass screening material. At this residence they had fiberglass screening on the windows. Over time, with age, fiberglass material will start to become brittle and weathercheck from exposure to the elements and UV rays. When this type of screening material becomes weathered, it is prone to marking easily. If the oils in the skin come in contact with the material they will be absorbed into the material leaving the shape of the contact area. I had seen this before from handling old screening material. My interpretation of the impression on the window screen is that something had pushed forcefully upward on the screen, tearing the sides and bottom of the screen free from the frame with only the top edge left intact. At the upper end of the actual screen mark there is a series of small tears on the screen material. These are in alignment of where one would expect to normally find fingernails on the end of the digits. With permission, I took measurements, documented the find with photographs, and eventually got permission to remove the screen. I later replaced the screen with a new one for the residents. All photos courtesy of Dennis Pfohl. As the original unaltered screen is pushed inwards and upwards, the first light colored (tan) markings are left from the abrasion of the skin contacting the material that is still tight on the frame. This is also when the tears occurred at the area where we would assume the digits would be. Those could have been caused by fingernails, the fingertips, or even the tips of the dermal pads if it used enough pushing force. Additionally the screen is actually stretched a bit. There are four concave, large, finger-width grooves (approx 30mm) following the length of the imprint and leading to each tear. This is where one would expect to see just this type of damage from pushing on it. I believe the lighter coloration was the first contact, but the screen didn't tear completely from the frame. There is typically only around an inch of space between the screen material and the glass of the window. This small gap does not allow enough stretch to occur without breaking the glass itself. The second attempt, and the larger mitt shape, is what tore the screen from the frame. The impression indicates it lifted its hand slightly before pushing upwards giving a better contact area against the material (this is probably the force that tore the screen from its frame) almost like a double strike. I have seen this in the past when working on similar material, and it is common. That is why I recognized what I was looking at right away. 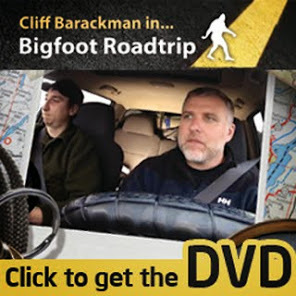 Happy Birthday, North American Bigfoot Blog!